It’s known enough to play at a party with your peers, or while doing things around the house. A movie about Baby Boomers in the late 70s and early 80s transitioning into their 30s, with some holding onto their ideals and others leaving them behind. Drums sound crisper and feel remarkably subtle on this pressing. It’s possible to really appreciate how skillfully Bill Berg, who plays on half the tracks, uses dynamics. Bass guitars also come across fuller and more sharply defined, without seeming too forward. On sparsely arranged tracks, such as “Simple Twist of Fate,” the bass is more clearly set off and rounder in tone, while Dylan’s guitar sounds more natural and harmonically layered. The touch of reverb on Dylan’s voice throughout the album is also easier to hear. In addition, the occasional shrillness that accompanies the harmonica solos on the original pressing has been replaced with a warmer, richer presentation. Larger ensemble pieces have more space to stretch out, resulting in enhanced transparency and focus. For instance, each of the guitars on “Meet Me in the Morning” is clearly delineated and arranged behind Dylan in a more logical manner. By extension, the interaction of the six-string instruments gets laid out before you. Every guitar-pick stroke seems audible. The first couple of times I played the Mobile Fidelity LP, I missed some of the edge in Dylan’s voice on “Idiot Wind” and “Tangled up in Blue.” But repeat listens reveal more emotional depth in his singing and a tenderness in many of the lines not as evident on the earlier LP. 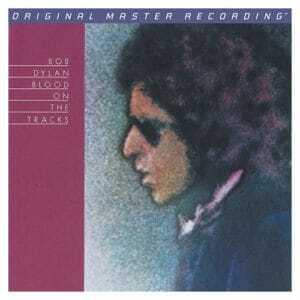 Blood on the Tracks represented a return to form for Dylan and a reminder of his greatness. It has never sounded better than on this Mobile Fidelity pressing.